On Saturday 26 October 2013 Fashion Designers’ and Craft makers’ Young Designer Awards recognised excellence and celebrated the achievements of some of the newest and the brightest UK designers at the Pullman London Hotel St. Pancras. The FDC Young Designer Awards is proud to announce Chanette Laing as the 2013 FDC Young Designer of the Year her dress embodied Alexander McQueen’s life and work and visually expressed his spiritual realm; Chanette named her design ‘The Internal Body’. The second place 2013 FDC Young Designer Award went to Kate Clark, her design was named psychomachia, inspired by the theme of the romantic gothic with influences from the poetry of Emily Dickinson and Emily Bronte’s Wuthering Heights. The corset has bones along its seams, representing the idea of the inner soul and the secrets we keep hidden, even from ourselves. 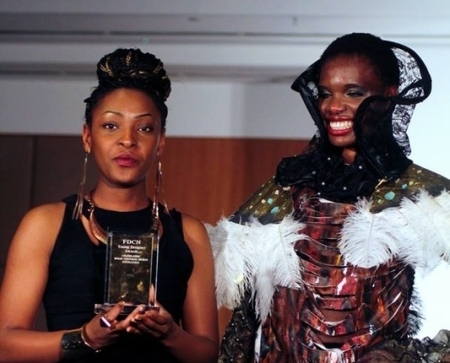 The 2013 FDC Radical Designer of the Year was awarded to Daisy Harris-Burland who is founder of Dumpster Design, a fashion label that specialises in the design and creation of commissioned couture pieces made entirely of recycled materials. Her collection is based on the Seven Deadly Sins. Second place 2013 FDC Radical Designer Awards went to Erwin Michalec; Erwin is more an artist than a fashion designer; each of Erwin’s dresses was based different paintings inspired by many ethnic Influences. Isaac Hall-Nixon was awarded a special recognition for his determination and commitment to his craft; all of the winners are truly ones to watch and will be given opportunities to be presented to either Fashion Designers Expo Florida, Maryland Fashion Week and Vancouver Fashion Week directors for a free showcase, all designer will be offered the opportunity to show case in our Angelman Syndrome Charity show in New York. This year the panel of judges selected some excellent and deserving young designers to receive the FDC Young Designer Awards. Rachel Johnson, Course Leader of Fashion Design Level 3 Gloucestershire College. Theo Omambala top international model gracing the catwalks of renowned designers such as Vivienne Westwood, Oscar de la Renta, Alexander McQueen and Dolce Gabbana and Photographed by top photographer Nick Knight; is also the Founder/ Creative Director Theo’s Vision La Haute Culture. The other designers who took part in our showcase were: Sumneema Rai, Karen Robins, Melissa Anukem, Natasha Muzembe, KiKa Holanda, Szimonetta Szabó, Taslima Khan, Lindsey Tait, Anoush Waddington, Barbara D’Altoè, Abbie Miriam Ivy Smith, Tracey Cochrane, Theresa Harnois and Albert Martincich.